Association for Library Service to Children (ALSC), an ALA division. Association of Specialized and Cooperative Library Agencies(ASCLA), an ALA division. A consortium of states working together to provide high-quality summer reading program materials for children at the lowest cost possible for their public libraries. Includes lesson plans, activity handouts, and graphics for each Summer Reading Program. Send an email to help@librarieswin.org to add your email to our list! An email list to share programming ideas and support for WVLS member libraries. Open to all staff serving youth. Tessa Michaelson Schmidt, the Public Library Youth and Inclusive Services Consultant from WI DPI, frequently shares top resources. A place to share programming ideas and support for WVLS member libraries. Open to all staff within the Wisconsin Valley Library System and the Northern Waters Library System involved in serving our youth. Feel free to share resources, photos, files, etc. If adding multiple photos please create an “album” by clicking on the above photo tab. The Wisconsin Library Association’s Youth Services Section provides a forum and resource for people in Wisconsin’s libraries who share a commitment to serving children and young adults, their parents, caregivers, and teachers. The Association for Library Service to Children (ALSC) is a network of more than 4,000 children’s and youth librarians, children’s literature experts, publishers, education and library school faculty members, and other adults committed to improving and ensuring the future of the nation through exemplary library service to children, their families, and others who work with children. ProgrammingLibrarian.org is a place for library professionals to share, learn and be inspired to present excellent programming for their communities. Create a profile for your kiddo. Track books! Type or scan in titles! Read 3 books per night you’ll be done in 3 years! Many libraries use paper record books for their participants such modeled after the national 1,000 Books Before Kindergarten template. 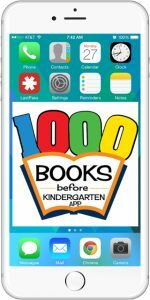 1,000 Books B4K App is here for Android and Apple products! WVLS partnered with Bridges Library System to create a FREE app for all library users. Please visit the 1,000 Books Before Kindergarten Toolbox or the Bridges Library System webpage for free promotional samples, graphics, reading logs, completion certificates, AND the 1,000 Books App Overview for Library Staff! The overview includes direction on how to transfer paper records into the app with a simple trick for librarians. Libraries Transform, An initiative of the American Library Association. Newbery, Caldecott, Sibert, Wilder, Carnegie, Batchelder, Belpre, Geisel, and Odyssey awards and the May Hill Arbuthnot Honor Lecture. Exemplary books, videos, recordings, and computer software for children. Notable Children’s Recording List – Audiobooks! Read On Wisconsin! Annual book lists for birth through high school. This blog created by Katie, an Early Literacy Librarian, includes storytime plans with books, props, songs, and reviews on topics. Stumped on a good book or song for a topic? This blog’s for you! Lindsey and Dana, two children’s librarians created Jbrary as a class project for one of our MLIS courses, and has since grown into a blog and YouTube channel we use to participate in the virtual youth services world. Storytime Lesson Plans! Because, why should we all have to write our own week after week when we can share good ideas! This blog is committed to providing free, comprehensive early childhood education activities for all families. the blog includes tips and recommendations for storytimes, training on pertinent topics (rowdy storytime attendees, parent expectations, and more), advocacy, and more! The ALSC is a section from ALA dedicated you children’s services. Their blog is amazing and provides resources and tips to be used right away and also discussions of larger youth services topics. A place to share programming ideas and support for WVLS member libraries. Open to all staff within the Wisconsin Valley Library System and the Northern Waters Library System involved in serving our youth. Feel free to share resources, photos, files, etc. If adding multiple photos please create an “album” by clicking on the above photo tab. Thank you and WELCOME! A unique and vital gathering place for books, ideas, and expertise in the field of children’s and young adult literature. Aims to support Wisconsin caregivers of young children with information about early literacy so they can prepare children for learning at school and beyond. Find songs, activities, crafts and more! Read On Wisconsin (ROW) is a state-wide literacy program, that promotes high-quality books for children and teens. Each month features one or more Read On Wisconsin titles for children and teens in five different age-level groups. Saroj Ghoting is an Early Childhood Literacy Consultant and national trainer on early literacy. She presents early literacy training and information sessions at national, regional, and state conferences, and training for library staff and their partners. Her website features resources for early literacy research, storytime, handouts and activities, summer reading, videos, and hosts a storytime brainstorming page. With a focus on Fairy Tales, this blog includes posts about current events (Banned Books Week), book reviews, and books gathered by topics. Marge Loch-Wouters is a retired Children’s Librarian and Youth Services Consultant who loves working with youth librarians and strategizing on creating great sustainable service. This toolkit aims to offer a better understanding of what is means to pattern, train, and facilitate learning with early childhood educators whose students are growing in independence and ability as they approach school entry. Resources for School Librarians: Resources gathered by retired school librarian. Administrator’s Guide for 21st Century School Librarians: UW System School Library Education Consortium. Building a relationship with K-12 librarians and teachers is essential. Sonja Ackerman (K-12) and Sue Abrahamson (Public) team up to show us how school and public librarians can work together for great results! Do you communicate regularly with your K-12 librarians? Do you support K-12 librarians and teachers during the school year? Do you have a list of K-12 Teacher emails that you could use for announcements and feedback? Do you send Summer Reading Program information to K-12 librarians well in advance (February)? Do you set up a library booth at parent teacher conferences or open houses? Attendees learned how to create high-interest STEAM programs on a low-to-no budget, tackle local STEAM grant writing, test out virtual/augmented reality, the 1,000 Books Before Kindergarten App, passive coding activities, AND tried an Hour of Code! Emily Zorea, Youth Services Librarian of the Brewer Public Library in Richland Center, kick-offed the day with “Engaging Families, Youth, and Teens around STEAM and Thematic Programming.” Julie Kinney, Teen Librarian for Marathon County Public Library, and Tammie Blomberg, Director of the Rib Lake Public Library, led the group through the Hour of Code and talked about bringing coding concepts to teen and adult library users. Find more from Emily at her Sowing Seeds Librarian blog.